With England right back Kieran Trippier and Belgium central defender Toby Alderweireld left out of the squad for what Pochettino described as "technical reasons", it was a chance for Serge Aurier and Davinson Sanchez to stake their claims. For 86 minutes they impressed in a measured away display and Spurs were comfortably protecting the lead given to them by Christian Eriksen's deflected 53rd-minute effort. But all the good work went to waste as Mauro Icardi volleyed in an 86th-minute equaliser and Matias Vecino looped in a 92nd-minute winner to give the hosts the points. Inevitably the post-match questions returned to Pochettino's decision to travel to Italy without Trippier and Alderweireld, especially as Dele Alli and keeper Hugo Lloris were also unavailable because of injuries. "Why? They were on the pitch against Liverpool and Watford. They are easy targets," Pochettino said before losing his cool. "We need to talk about football," he said. "You force me to say something that is not good. You disrespect the players who were here today. You can blame me on my selection of the starting 11 but please don't disrespect the players on the pitch." 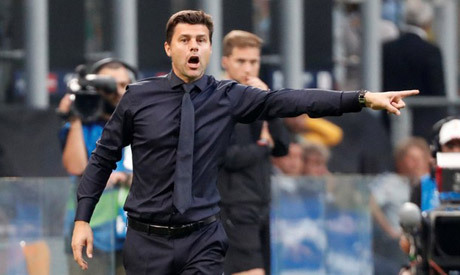 Pochettino has who has now lost three consecutive matches for the first time since taking over at Tottenham in 2014, felt the defeat in the San Siro disguised what he described as their best performance of the season so far. "I'm happy with the performance -- we dominated until the end -- but of course the result was so cruel. For me it was our best performance since the beginning of the season," he said. With Barcelona, who romped past PSV Eindhoven also in the group, the result was a hammer blow for Pochettino, whose side now have precious little margin for error. "The last few games, we're paying a lot and suffering the punishment for our mistakes," Pochettino said. Nerazzurri coach Luciano Spalletti said it was more than a "normal victory" after a poor start to their Serie A campaign in which Inter have picked up four points from four games. "We got the result thanks to strong pressing at the end," he said. "This win is obviously different to a normal victory, also due to the extraordinary support from our fans. "The game this evening leaves us with a different feeling as regards what we're capable of doing." Inter keeper Samir Handanovic said the team had shown great character to grind out a crucial win. "We continued to play even after Tottenham's goal and the team wasn't disjointed, as in other games," he said. "The stadium pushed us on. It was a fantastic evening, a spectacular match with a crazy atmosphere." With PSV Eindhoven to play next, Inter have put themelves in a good position in a group in which Barcelona are the clear favourites to reach the last 16. "The group will be very balanced right until the end," he said. "This win gives us strength not to give up and provides us with a lot of enthusiasm."